Carol and I were out Tuesday afternoon going to meet with someone, and along the way the Prius started to get a slight rattle, almost like driving along grooved pavement. Pulled off the road and it seemed to stop… then back on the road (Loop-101, one of several highway bypass routes that help travel in and around the Phoenix metro area). It seemed to be calmer… then louder… then a “thump” underneath the car. But then everything seemed fine. We were half a mile from our exit, then half a mile from the showroom. When we got there, we looked around… and, well, everything seemed normal! Fast forward an hour and a half when we’re coming out… and yes, the left front tire was flat. So interesting for it to seem normal after seeming to “fail”. After removing the tire, I did the normal "roll it along a bit" to see where a tread puncture might have occurred... and didn't see anything! Looks like something -- maybe a screwdriver? 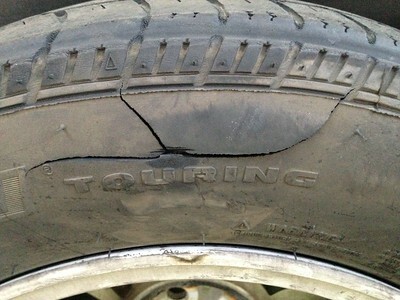 -- had punctured the sidewall. Fortunately, the tire seemed to "hold" while driving along Loop 101. When I was changing the tire at the showroom, the car had cooled down and was in the shade. I put the "donut spare" on, and it seemed a little low on air, so we drove a couple of blocks to a "Shell station" -- more of a convenience store with a co-located car wash and oil change service. No air pressure equipment at the Shell place, so I drove up to the oil service, where a guy was standing outside chatting on his cell phone, and nobody in the two work bays. I explained what happened, and he said, "Yeah, it does look a little low, but no problem, I'll put some air in it for you." He grabbed an air hose, filled it up, and said "There you go. Drive safe!" No charge... but I gave him a tip -- $4 I had in my pocket. He smiled and said "Thanks, I appreciate that!"